Of all the famous buildings in New York, few are vested with as much lore as the Plaza hotel, the French Renaissance–style landmark that has presided over the corner of Fifth Avenue and Central Park South since 1907. Thanks to coverage in newspapers and society columns, cameos in movies, and a starring role in the beloved children’s book Eloise(whose spirited title character calls the hotel home), the Plaza has a special resonance. In the case of Lisa and James Cohen, who were married in the hotel’s Grand Ballroom in the early ’80s, the connection is particularly powerful. Today James is the chairman of Hudson Media, as well as a partner in Dufry, the world’s largest duty-free retailer, while Lisa is the home editor for DuJourmagazine. All of which means the two know a good thing when they see it. So when the couple learned that a prime corner unit in the Plaza—which several years ago was partially converted into some of the city’s most sought-after apartments—had become available, the opportunity was too enticing to pass up. As it turned out, the residence encompassed the very rooms Lisa’s family had occupied on the eve of her wedding. "My mother still has the room key!" Lisa confesses. Boosting the apartment’s appeal was the fact that Frank Lloyd Wright had lived there in the ’50s when he was overseeing construction of the Guggenheim Museum. 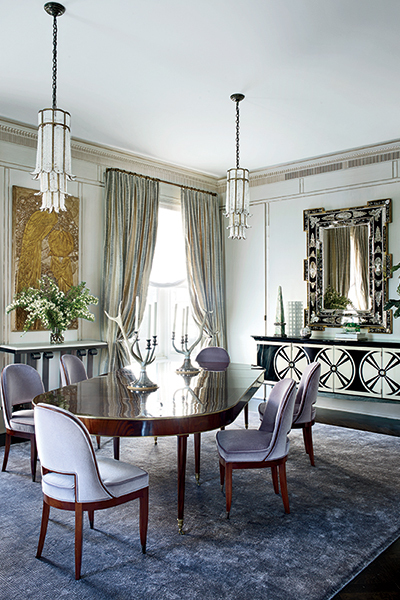 For the Cohens, whose primary residence is a Tudor-style house in New Jersey (Architectural Digest,February 2007), the idea of a Manhattan pied-à-terre was attractive for a variety of reasons. First, it would offer a perch for weekends in the city with their 11-year-old daughter or for overnight visits by their three college-age sons. Additionally, they could host work-related gatherings or offer international colleagues a place to stay. "For my husband’s business, we travel to different countries constantly," Lisa says. "We’ve been entertained so beautifully, and I wanted to be able to do the same for guests here." 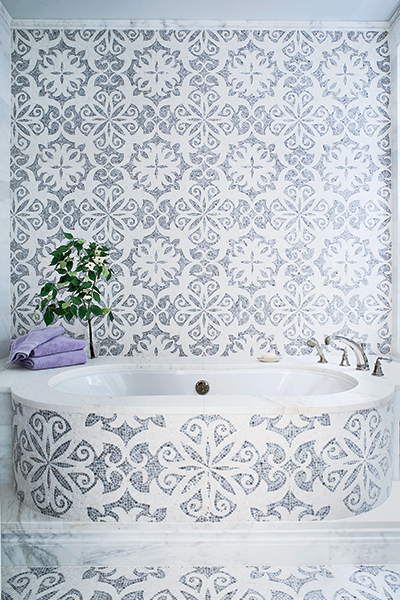 To help transform the space, Lisa turned to decorator Susanna Maggard. The two had bonded years earlier when Maggard was an associate for designer Alexa Hampton and worked on the Cohens’ New Jersey home. Says Lisa, "I spent a lot of time with Susie"—who now has her own firm—"and I realized we were a great team." From the outset it was clear that a major overhaul of the layout was called for, as it featured just a single bedroom and a living room that was too small. Also, with the wings of the L-shaped corner residence connecting in the interior only, any interplay of light between the two exposures was cut off. To help address these issues, the Cohens enlisted Manhattan-based architect Louis Lisboa ofVLArchitects, whose solution was to basically gut the apartment and start over. He shrank the master bedroom and expanded the living room on both ends, a move that enhanced the light and views. And to ensure sufficient space for the entire family, he created three additional bedrooms—one of which does double duty as a den. Plus, by reworking the mechanical systems, Lisboa was able to reclaim six inches of ceiling height, a valuable improvement given the couple’s extensive art collection, which includes pieces by Willem de Kooning, Jean Dubuffet, George Condo, and Mark Grotjahn. Lisboa also customized moldings and other details, among them a set of pocket doors—painted to imitate Macassar ebony—between the living room and entrance hall. That same finish appears on the engaged columns that provide a subtle separation between the living and dining spaces while maintaining an open feel. For the furnishings, Lisa initially gravitated toward Art Deco, giving Maggard leeway to mix in designs from other eras. "We knew it couldn’t be only Art Deco because that would be too serious, and that’s not Lisa," Maggard says. So while the home boasts an array of exceptional Deco finds and other rare vintage furnishings, the overall effect is one of breezy refinement, thanks to a leavening selection of lively postwar pieces. "I’m not a rigid person," Lisa says. "I wanted the apartment to feel joyful and fun." 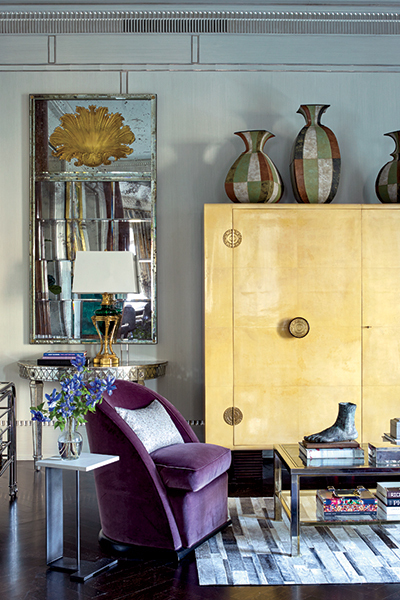 Nowhere is this more evident than in the den, where a coconut-shell-veneer cocktail table from the 1970s sits beside a pair of ’30s Spanish modern armchairs. With the room’s clashing patterns—Deco-inspired fans on the sofa, hexagons on the carpet—and tribal art, it’s an appealingly madcap space reminiscent of Trader Vic’s, the storied restaurant that long operated on the Plaza’s lower level. Still, it’s the lavender master bedroom, with its Murano-glass chandelier, striped canopy bed, and mirrored side tables, that perhaps best captures the home’s spirit of comfortable elegance. "For me it could not be more luxurious or romantic," Lisa says of this sanctuary. "Whenever it’s time to go back to New Jersey, I think, Can’t I stay just a little longer?"